"The hardest soul to save was his own." 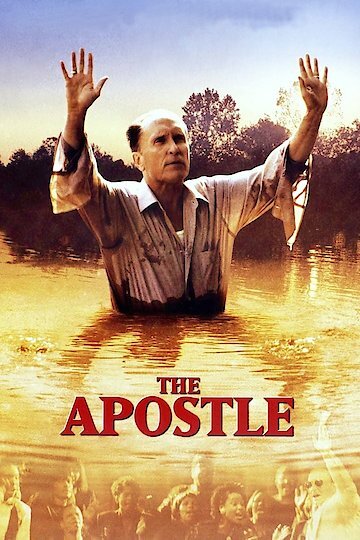 Starring Robert Duvall, The Apostle tells the story of a minister who has his faith and beliefs shaken and must make a journey of self-discovery to find his way back again. E.F. 'Sonny' Dewey (Duvall) has built a large church that has developed a huge following and has even proven to be profitable in the investments that have been made on its behalf. Although Sonny still preaches the word of God and believes in what he preaches whole-heartedly, he begins questioning the direction of his life and faith when he discovers that his wife (Farrah Fawcett) is not only voting against him to have him removed as head of the church that he founded, but that she is also having an affair with the board member who initiated the actions against Sonny. Sonny tries to find his way through the issues plaguing his life; however, he loses his control during his children's softball game and attacks his wife's lover with a baseball bat. Realizing what he has done, Sonny flees and finds himself at a crossroads, both figuratively and literally, and must choose his direction. Making his decision, he finds himself in a small Louisianna town and decides that he wants to begin again from scratch. Sonny soon finds an old abandoned church and decides that he wants to begin preaching again in a simple country church and soon makes a deal to use the church and to fix it up. Sonny soon finds followers eager to hear his style of old fashioned preaching as the church begins growing by leaps and bounds. Even those opposed to the mixing of races in the parish soon join the congregation. Sonny soon finds romance as well as a new purpose to his life through preaching in person and on the radio. However, Sonny's past catches up to him as he is arrested for his crime. The Apostle is currently available to watch and stream, buy on demand at Amazon, Vudu, Google Play, FandangoNow, iTunes, YouTube VOD online.